Sammy the horse lives at a rescue facility that takes care of farm animals needing rehabilitation. But when the owner of the stables came in to the check on the horses, she found Sammy had gotten a haircut, that is anything but flattering! Everyone at the barn was up in arms after then saw the hilarious haircut this horse got from a dad who thought he was being helpful! So my dad calls me the other day, says he got in trouble at the barn for cutting a horses hair and everyone’s pissed off. I felt bad for him until I got this picture from my mother. “As for some of the questions, I can elaborate! 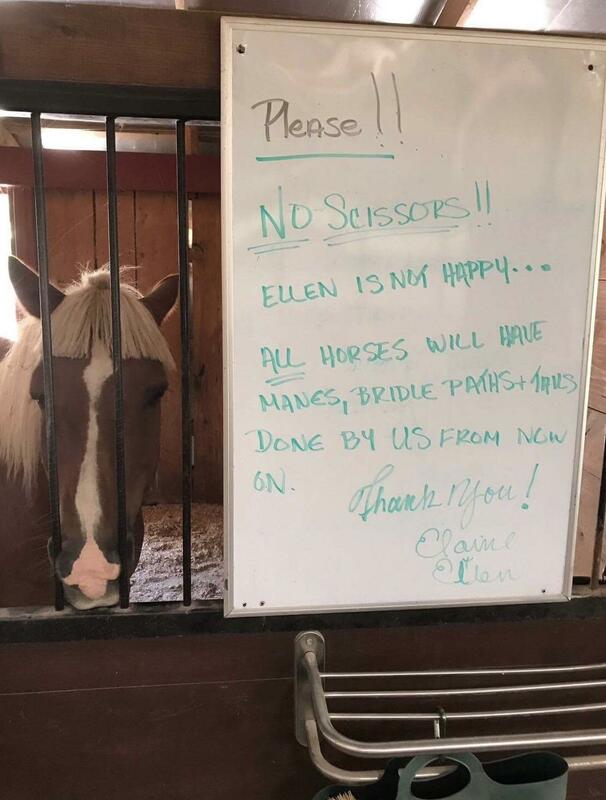 Ellen owns the stables, she is not the horse. The horses name is Sammy. I don’t know who specifically owns the horse. My parents own a horse that is boarded at this stable. The stable is a rescue facility that takes in all farm animals that need rehabilitation, and they also rent out a few stalls for some horses. “My parents go there multiple times a week to take care of their horse, and while there they help out around the barn doing pretty much whatever they need done. “According to my dad, he was cleaning out the stalls and he felt bad that the horse’s hair was getting in his eyes, and honestly thought he was helping the horse out. Its the thought that counts and Sammy is beautiful either way! I’ve paid good money for worse haircuts than that! The poor guy! It is the thought that counts and the hair will grow back. He could have taken clippers to the body which would really be bad. After all the horse is famous now! God bless them both! Happy Sunday!! maybe Sammy likes his new look!! Read this Garbage ASAP! New GAO report controlled by Pro SLAUGHTER Complete Lies and propaganda. 2 million extra horses in the US? We have no breeding and all kinds of horses that went to slaughter since 2006 and they say we still have more than we started? By 2 million. Read the WILD HORSES 200,000 RUNNING AMOK AND 90,000 FERAL ON RESERVATION. THIS IS COMPLETE GARBAGE. https://www.horsetalk.co.nz/2017/08/21/pressures-blm-wild-horse-budget/#comment-118341. SNEAKY DIRTY UNDERHANDED SLAUGHTER. THE CALVARY GROUP WAS BRAGGING ABOUT SMEAKING INTO THE USDA AND DESTROYING EVERYTHING WE HAVE WORKED FOR. THESE LOONS ARE CANIVING…..PLEASE READ COMMENT ARTICLE AND CONTACT CONGRESS ASAP! THIS IS WAR, WE HAVE TO SAVE THE HORSES. SURELY CONGRESS WILL SEE THEIR LIES.